Harte Gold has received all necessary operating permits from the Government of Ontario to start commercial production at the Sugar Zone Mine. Harte Gold is now fully permitted to mine, process ore and pour gold on site. Full commissioning of the mill complex is nearing completion. Testing of the crushing and conveyance system is complete and water has been successfully circulated through the mill. The power line has been built to the site and all electrical equipment has been delivered and installed. The Company will connect to the Grid and energize the entire Sugar Zone Mine site and Mill complex this week. Underground development work continues to exceed targeted rates. For the month of July, 254 metres of development was completed, or 8.2 metres per day. Development completed to-date has opened up several areas in the Sugar Zone Deposit, particularly in the near-surface Upper Zone area, to provide early high-grade stopes. The Company continues to review and refine its mine plan to optimize operations. 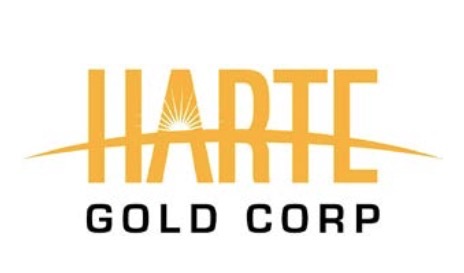 Harte Gold is focused on the exploration and development of its 100% owned Sugar Zone Mine where it has completed a 70,000 tonne Advanced Exploration Bulk Sample, mined 30,000 tonnes under a Phase I Commercial Production Permit, permitted and built an 800 TPD processing plant. 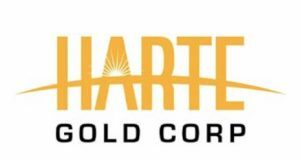 Harte Gold received operational permits to start full commercial production September 2018. The Sugar Zone Mine is located 80 kilometres east of the Hemlo Gold Camp in Ontario. Using a 3 g/t Au cut-off, the Mineral Resource Estimate dated February 15, 2018 contains an Indicated Mineral Resource Estimate of 2,607,000 tonnes grading 8.52 g/t for 714,200 ounces contained gold and an Inferred Mineral Resource Estimate of 3,590,000 tonnes, grading 6.59 g/t for 760,800 ounces contained gold. 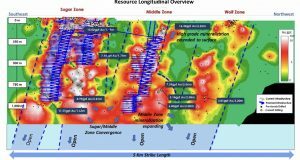 Harte Gold also holds the Stoughton- Abitibi property on the Destor-Porcupine Fault Zone, east of Timmins, Ontario adjacent to the Holloway Gold Mine. Harte Gold Pours First Gold!